ARE YOU A QUESTER? Would you know a Quester if you met one? Could you become one? What are Questers anyway? By learning about the courage and imagination Questers rely on to find career happiness and growth, you may discover ways to take better control of your career—and life. Some started taking charge of their careers early. Others were near retirement. Maybe you share some personality characteristics Questers tend to have. Where do you fit? Take the Quester Quiz. Because they work hard and are goal-oriented, they tend to succeed. Indeed, some become billionaires or achieve celebrity. Money and prestige, however, are by-products. Questers include the accountant turned potter, the laid off worker who created her new job, and the millionaire who started his business with $60.00. Perhaps you’re thinking that Questers must be extraordinary or glamorous people. Not really. They’re individuals like you and me who face career challenges common to most. But they have learned to do something about their difficulties. They have learned to take control. You can, too! We’re all born with Quester qualities. You see them in infants as they excitedly explore every nook and cranny in their homes. Unfortunately, as people grow older, many lose this passion for exploring and growing. That doesn’t have to be you! Start planning for greater happiness and personal and professional growth today. 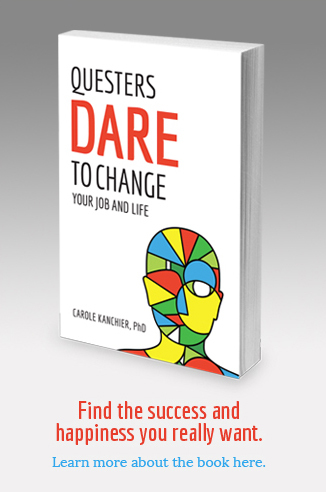 Questers Dare to Change Your Job and Life shows how to rediscover, renew, and strengthen your Quester qualities. Author, Dr. Carole Kanchier, encourages you to reassess your views of career success, and strengthen Quester traits such as purpose and intuition to succeed. Carole Kanchier has worked with clients representing varied industries, and has taught at the University of Alberta, University of California, Berkeley and Santa Cruz, and other institutions of higher learning. She chaired the Career Change Committee, National Career Development Association, and was Advisory Board member, College Admission Counseling Program, University of California, Berkeley. Dr. Kanchier walks her talk!